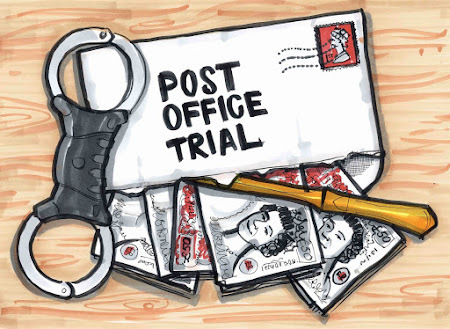 Although the courtroom was busier than its been since the trial started, with a large number of former Subpostmasters and observers from the Post Office, there were only two journalists present, a deeply unwell Karl Flinders from Computer Weekly and meself. I spent the day live-tweeting proceedings. You can read the morning session's tweets here and the afternoon session tweets here. Or read them in their original form as a thread on my twitter feed. The day started with the second half of Pam Stubbs' evidence. Pam was a Subpostmaster at the Barkham Post Office near Wokingham for 10 years after her husband's death. In 2009 she moved, with her Horizon terminal into a Portakabin in the Post Office car park whilst her branch, shop and accommodation attached to it was more-or-less rebuilt. By the time she was suspended in June 2010, the Post Office claimed she had managed to lose around £25,000 and was demanding it back. Pam was asked to confirm that she had no real problems with Horizon before she went into the Portakabin. The Post Office's QC, the extremely capable David Cavender, notes that there appeared to be a lot of mistakes made by Pam or Pam's assistants in the branch. Pam admits that some assistant were better than others, and she had a particular problem with an assistant who would press the same button multiple times when "remming out" cash (counting, packaging up and remitting cash out of the branch for collection by CashCo), which caused problems. Pam says she became very hot on ensuring it was done properly. Pam is asked why, when large sums of money started going missing, she didn't take steps to see if the assistants were messing up and/or walking out of the door with it. Pam says the discrepancies were so large and so random, that checking Horizon figures to see even how and when the sums of money might have been going where and when was impossible. She says she was advised to hunt the extra zeroes in her transactions to see if any customer was walking out the door with 10x the money they'd withdrawn. This information just wasn't in the Horizon receipts, so it was impossible to even start investigating. She said one day such a large discrepancy arose, but with no extra zeroes obvious in the transaction receipts, she concluded that every single customer who came into the Portakabin must have had an incorrect transaction to get close to the sums of money Horizon said she was missing. At one point in court the farcical day when an auditor was sent down to visit her Portakabin was discussed. He sat with Pam for a complete morning session to see if he could see what she was doing wrong. As she keyed her customer transactions into her Horizon terminal, he sat with a his laptop running Horizon software, keying the same customer transactions into his offline version. When Pam ran a balance check at the end of the session (counting cash and stock versus what Horizon says she should have in the till), she was around £190 down. The auditor told her he would feed his transactions into her Horizon terminal and she would find, because he had done everything correctly, it would balance to zero. It didn't - the discrepancy got worse - it became £362. This caused some consternation. He checked everything again and eventually told Pam that although he couldn't explain it he was going to have to accept the Horizon figure on the screen, which became her discrepancy and her debt. There was subsequently revealed to be an internal memo about this episode. Whilst the Post Office was still considering legal action against Pam for the cash discrepancy, someone suggested that things needed to be resolved quickly as the only thing the visit of the auditor had achieved was potentially creating a witness for the defence. I have asked for this document. 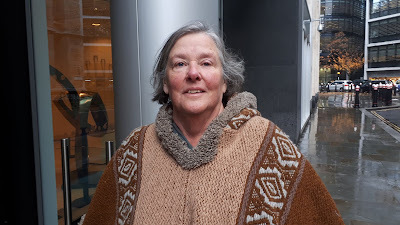 Pam maintained throughout her experience at the time, and in her witness statement that the Post Office did little or nothing in terms of investigating her situation with Horizon by talking to Fujitsu (which operated and supported Horizon under contract to the Post Office). There was as internal documents reveal quite a bit of to-ing and fro-ing between the Post Office and Fujitsu, but this was never revealed to Pam. However Mr Cavender was able to point out that actually the Post Office was doing far more than Pam knew to resolve the situation. I have asked for this document too. There was then a really lengthy discussion about £7,000 which was chalked up as a discrepancy. What happened is that another auditor arrived whilst Pam was cashing up to rem out (Pam's Post Office was one where local businesses would come to pay in their cash. She and before her, her husband were so trusted that each week they would take in far more than they ever paid out - Barkham is not the sort of area which does much business in the way of paying out cash benefits etc). As is the rules, the auditor takes over. Somehow the auditor managed to rem out £7K more than left the branch. This £7K stayed in Pam's safe when it should have gone to CashCo. She didn't know it had already been remmed out, so the following week she remmed out the £7K alongside £15K of other takings. The Post Office added this £7K to Pam's outstanding debts and demanded it back. However after she was suspended, the mistake was realised and a transaction correction was issued. The first £7K was a phantom amount and the transaction correction recognised this. However because this came through after Pam was suspended, no one told the relevant department and Pam was still receiving demands for the money. I really couldn't work out why Mr Cavender was highlighting what seemed to be a case of double incompetence by the Post Office to make a point. First an auditor, not Pam remmed out the wrong amount on Pam's account. Second, long after the error had been resolved the Post Office were still demanding it s part of her debt. Then it became clear. This, Mr Cavender pointed out, was not a Horizon error, yet Pam had blamed her woes on Horizon. 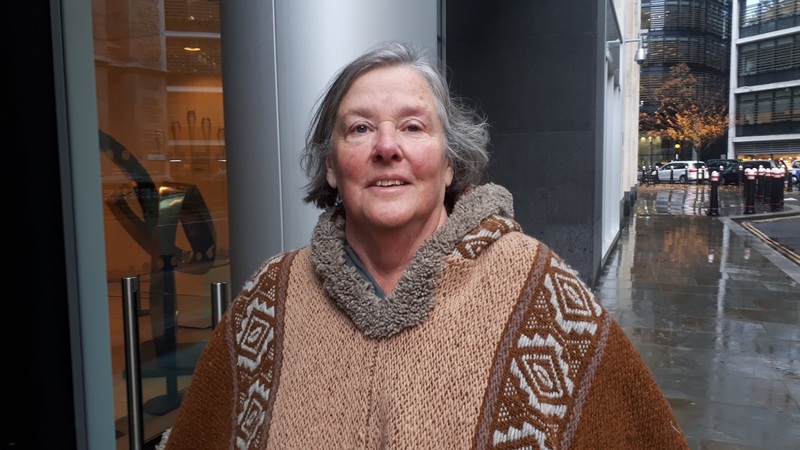 The final point of interest in Pam Stubbs' cross-examination was her refusal to surrender her Horizon printoffs/receipts for examination by a Fujitsu or Horizon expert against their data. She said she wanted them to come to her. She said she did print off one day's worth of receipts to send off for them to look at. It went to 22 pages. And, she said, that was a quiet day. She said she couldn't do the maths, but if she did that every day for the 8 months in dispute it would be a lot of photocopying. The judge helpfully intervened to point out it would be around 5,500 pages she'd have to send off. Nonetheless, said Mr Cavender, you didn't do it. No - said Pam - she thought it would be better if a Fujitsu expert came to her and they could sit side-by-side at her dining room table going through their data and her data to see where the discrepancies were. This never happened. Pam was re-examined by the dashing Patrick Green, counsel for the claimants, who asked her about a reassurance she got that the huge discrepancies she was suffering would remain in dispute until the Post Office had completed their investigation into what was happened with Horizon at her branch and shared it with her. Patrick Green then asked her about a letter she got less than a month later demanding £10,000, telling her she was responsible for all losses in her branch and asking her to contact them with a method of payment. What did you read into that, he asked? Pam supposed it meant that the Post Office had no intention of carrying out an investigation into Horizon and, furthermore, she said, they didn't because they didn't want to know if the result showed Horizon in a bad light. Also if they had done an investigation she never saw it, despite her requests and the repeated requests of her MP, she has never seen the evidence or results of any investigation into Horizon at her branch. The afternoon was a generally different kettle of fish. Mohammad Sabir took the stand and was cross-examined on much the same terms as Alan Bates on Day 2 of this trial. Mr Sabir took over two Post Office branches, Cottingley and Crossflatts (in Bingley, north west of Bradford) in the space of twelve months in 2006/7. He was terminated in October 2009. Mr Sabir's spoken English and understanding of English is not that great to the extent that Mr Cavender was having difficulty making himself understood. Unlike Alan Bates and Pam Stubbs, whose cases I know well, Mr Sabir was something of an unknown quantity to me. Mr Sabir's initial cross-examination evidence largely consisted of him telling Mr Cavender he didn't understand what he was being asked or didn't remember what he did understand he was being asked. Thankfully after an hour I was given Mr Sabir's witness statement, which at least gave me a clue about the conversation I was supposed to be reporting on. In short, Mr Sabir became Postmaster of two Post Offices. He never really seemed to feel on top of Horizon and he had particular problems with how to account for his lottery scratchcards on Horizon. He tried to get rid of both Post Offices, but before he could he was audited, a discrepancy of £5K was found on his scratchcards in one branch, he was suspended in both branches and then terminated. Mr Cavender: "Is that correct?" which I never quite got used to. Anyway, there were a couple of significant exchanges. As with Alan Bates, Mr Cavender was keen to pursue what I'll call the Line of Incredulity - the idea that someone as experienced in business as Mr Bates or Mr Sabir would ever sign a contract without having view or knowledge of its contents. In this case the mythical Subpostmaster contract, which so far, Alan Bates, Pam Stubbs and Mohammad Sabir say they never saw. Mr Cavender said that Mr Howarth, the Post Office employee representative who interviewed Mr Sabir for the job has given a statement to the court in which he says spoke to Mr Sabir about, and explained the contractual relationship between Mr Sabir and the Post Office. He asked if Mr Sabir remembered this. At this point the judge jumped in quite fiercely and told Mr Cavender he was doing something he shouldn't be doing and which he'd been warned about before. He pointed out that Mr Howarth in his statement says he doesn't remember interviewing Mr Sabir and what he actually says in his statement is that this is what he would have done, rather than what he did do. The inference being that saying something would or should have happened is very very different from a witness saying this is what did happen. Mr Cavender rephrased the question to Mr Sabir in these terms. Mr Sabir said how should he remember if Mr Howarth couldn't. The judge intervened agained to point out that Mr Sabir's memory should not be contingent on Mr Howarth's. Mr Sabir couldn't remember anyway. Mr Sabir was eventually sacked because he had nearly £5K's worth of scratchcards debtits which he wasn't declaring on his accounts, yet was rolling them over as accurate. Mr Cavender said he had £5K in his safe, why didn't he put that money towards the scratchcard debt. Mr Sabir said he was trying the Horizon helpline for more info on how to do this and couldn't interrogate Horizon well enough to find out how to sort out his scratchcard mess. It was only when an auditor came in, worked it all out and came up with a figure for the discrepancy that he could pay the money, but by then it was too late, as he was suspended. But, said Mr Cavender - that means you were signing off incorrect figures whilst all this was going on. He used the word falstifying. Mr Sabir pushes back on this. He wasn't falsifying his figures. Mr Cavender says at the very least they were incorrect - why was he signing off incorrect accounts? Mr Sabir says he had to or Horizon wouldn't roll-over into the next accounting period and he wouldn't be able to trade. I've requested some of the documents discussed today. It would be good to read them. We have a new witness on day 4 of the trial. It all begins at 10.30am in court 26 in the High Court Rolls Builing on Tuesday 13 November 2018.